This morning I went to see ‘Seduced by Art’, the first exhibition at the National Gallery to feature photography. What a disappointment! The majority of photography in the exhibition was of the Turner Prize variety – full of nothing but post-justification of a trivial concept. The comparisons between the photographs and paintings were trite and largely meaningless and showed a complete lack of knowledge of photography on the part of the curators. I find it hard to believe that the comments in the labels had any thought behind them whatsoever. 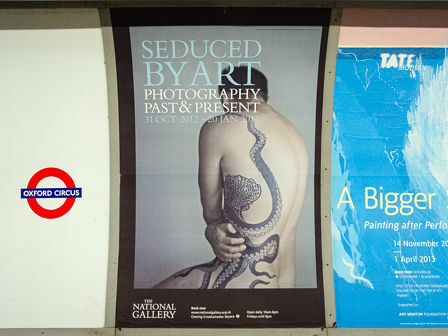 My favourite referred to the photograph of the naked Man with Octopus Tattoo by Richard Learoyd (which has been used on the poster for the exhibition) which describes how the tentacle rising up the man’s back follows and reinforces the curve of his spine. It just doesn’t! For a review that states it better than I ever could (and before you choose to part with the £12 entrance fee), you should read what Brian Sewell thought of the exhibition.